You are here: Home / Blogging / So I’ve called it the “Valentine Stylish Blogger Awards”. So I’ve called it the “Valentine Stylish Blogger Awards”. I’m giving this on valentine’s day with all my love for every supportive, impressive and amazing blogger out there. After hitting 1,000 hits and getting lots of fantastic support and sound advice from blogville, I got the Stylish Blogger Award! It can’t get better than this. Awesome! Thanks to Working Tech Mom who is such an inspirational woman, full of good humor and unbelievably smart. She recently began Ouch, Fired after she was released from her job- talk about moving onwards and most definitely UPWARDS. I’m glad I got to “meet” her here. Enjoy her blogs! 1. I quit pretty much everything that I’m not EXCELLENT at. This has included playing the clarinet, piano, and tuba. It also includes lace-making and volleyball. I’m sorta hoping that it’s not going to be the same story with golf. To be fair, I managed to continue writing even though I’m very average at that! 2. Overall, I’m very good with people and get on well with every type of person. But once in a while, I meet someone who doesn’t like me or who I can’t figure out. This really bugs me and I can stay fixated, analysing why I don’t seem to get on with this particular person. It’s unfortunate because sometimes, I let it drown out the other scores of people that like me a lot. 3. I’m a process-junky. If you want me to be effective, put a good process in place. I like to know what I’m doing and plan well ahead. So if you really want me to lose my balance remove all the processes or even worse, set up meaningless processes that everyone ignores. Arrgh! 4. I wanted to read Accountancy but studied Engineering instead. I’m great with numbers and I have been known to keep up to 25-digit numbers in my head at a time. I know my credit AND debit card numbers off by heart. 5. I have between 15 to 20 handbags. And I make no apologies for it :). 6. It’s only in recent years that I have become comfortable in my own skin. I cannot underestimate the need to love yourself the way you are. It affects the risks you take, how people treat you and whether you regret those things that made you happy even if on hindsight they may have not been the best of ideas. 7. I don’t understand people who are not ambitious. I realise not everyone is like me but gee, how does it feel not to wish yourselves ahead? It must be more relaxing, less frustrating and probably requires little or no fire-power. I’m green with envy. Sixthirtythree Fashion writer extraordinary. I’ve seen pieces on this blog that I dreamt about for days. And she’s a really great lady! Francine Henry Amazing photographer. Marketing guru and awesome lady. Kolembo Refreshing poet who has all the right words at his pen’s tips. Versatile Woman Mother of two with great advice. She’s a doctor and an all-round lovely gal. Chris Cocca One of my best finds of 2011. Just a great blogger with a cool demeanour and very interesting things to say. The Ramblings of a Demented Mind She’s just rambling when she says she’s demented. Very cool blogger and book-lover. Young and funny with the whole world in first of her for the taking! « Forget closing the gap between the rich and the poor…. Thank you thank you thank you! I am honored, and I can’t wait to share the love! U r most welcome :)! Haha! What a Valentine’s surprise! Better than winning the ‘Stylish Blogger’! You know, I’ve been struggling with this poem on love…can’t get the end to ‘come’…I don’t write about love too well, wonder sometimes if I ever have been in love, ever will be! But this warm feeling you’ve generated inside of me may just untangle some kind of end for this poem…I feel stirrings! I’m glad you enjoy my blog, I read you as often as you post, I think you thouroughly deserve the award, you honour people with your word, and writing with your commitment. Good things happen to Good People, sometimes. Can’t wait to check out the other bloggers you’ve mentioned…sure to be great fun! Lovely stuff and on, on eh! Happy Valentine. Anyway. I enjoy your posts, and I find you to be both intelligent and exciting. I’ll be checking in now and again to see what’s new. OMGee! I am almost speechless! Thank you so much. I am quite honored! Heck, I am thrilled!!!! Wow, what wonderful impressive 7 personas about you. You really know yourself quite well. Gosh, what a wonderful idea from WorkingTechMom! 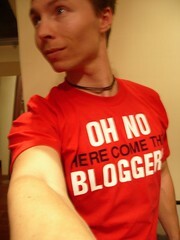 I’m going to check out the other bloggers. I agree with you about The Ramblings of the Demented Mind. She is a cool blogger and funny! I love your blog, too! You know I totally misunderstood this award until I ran across another blog with the award. I’ve been thinking WorkingTechMom who started the award would chose the final awardee out of the list you awarded. I have been wondering all this time who won and came back to this post to see who won. Well, I better get onto my duties of awarding, then. Yeah, her shots are awesome! What a good idea. I too read Chris Cocca’s blog daily and your smiling face pops up every time so I thought I’d drop by. Keep blogging. I’m off now to check the rest of your posts. Keep smiling. Sorry for the late reply! I was drowned in studies! (I know, NOT cool!) Buuuuuut thanks! After reading Sixthirtythree’s post I realized I’m guilty of something! Sorrieeeee! I’m going to make it right as soon as I finish studying for the upcoming exams! Jeeze! These are definitely dog days! 😦 Sorry again!